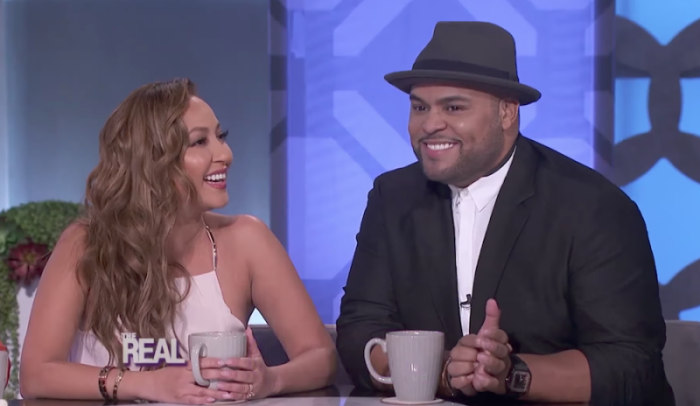 Adrienne Houghton and her husband, Israel Houghton, brought Christmas to Los Angeles early with a benefit concert for their Besos Care Package charity along with the Salvation Army Monday. The Houghtons hosted the benefit drive at The Belasco Theater in Los Angeles on Monday evening where they raised money and performed songs from Adrienne's upcoming Christmas album. Adrienne, the co-host of the syndicated daytime talk show "The Real," worked with her Christian singer-songwriter husband Israel to sell a range of $20 concert tickets to $100 VIP packages that included entry into a gifting suite. The Houghtons asked people to bring toothbrushes and toothpaste for the care packages that they make for the less fortunate in the Los Angeles area. "Besos Care Packages is a direct service project to meet the basic human needs of our neighbors struggling in Skid Row Los Angeles," a description of the Houghton's Besos Care Packages reads on the Southern California Salvation Army website. "Working alongside The Salvation Army, we aim to build and deliver 500 care packages for women on Skid Row all sealed with a kiss, handwritten notes, and more!" Israel supported his wife by taking to Instagram to tell the world about the event and how he and Adrienne were partners in purpose. "It's so amazing having a PURPOSE PARTNER ... This Monday night July 10 we are celebrating Christmas in July @belasco_los_angeles in an event benefiting the homeless of LA through @salvationarmy_entertainmentdiv @salvationarmyus & @besoscarepackages - @adriennebailon and myself will be performing a few songs from her upcoming Christmas album - you really don't want to miss this special night," he wrote. "..Let's make a difference together. #ChristmasInJuly." Last January, the couple hosted their first Besos Care Package event in downtown Los Angeles where they packaged and distributed over 200 care packages with the help of volunteers. In May, Adrienne's show "The Real" donated 1,000 care packages to her cause which left the talk show host in awe. "Still in disbelief and completely awestruck by @therealdaytime 's generosity toward @besoscarepackages - they donated 1000 Care Packages with @dove & @axe to help us reach out with love to precious homeless people in Los Angeles," the Besos Care Packages Instagram page reads. "We are Truly grateful to all who helped assemble the packages @therealaudience and to all who have donated through our partnership with @salvationarmyus!" For more information about Besos Care Packages and its partnership with The Salvation Army, click here.